Hi Stampers, Welcome to another Happy Stampers Blog Hop! Today we had a sketch challenge. As soon as I saw the sketch I knew I needed to use the Detailed Floral Thinlits Die to start my design. I also used the Botanical Blooms stamp set and matching die for the flowers in my sketch. The colors you could use are endless. Replace the pink with yellow or reds for a fun new version. All the flowers and leaves were made with the Botanical Blooms stamp set and matching dies. The Large Flower: Blushing Bride sponged with Melon Mambo ink. The center is Night of Navy card stock. All Leaves: Old Olive sponged and inked with Always Artichoke. The Bling: Pearls were added to the center of each flower and a few were scattered around for extra pop. A Night of Navy thin bakers twine bow was added for the finishing detail. To see each of our team members shares for today just click the “go to the next blog” button to visit each post. If you get lost along the way you can also click each name also. This is awesome Kristi. I love what you did with the detailed die and your flowers are beautiful!! Wow—what a wonderful way to close the gorgeous edgelit. Thank you for the tip–the inspiration and this beautiful card idea. Beautiful Kristi!! Love both the flowers and the wonderful edged flowers ! Great job . Absolute gorgeousness. Love everything you’ve done on this stunning card! 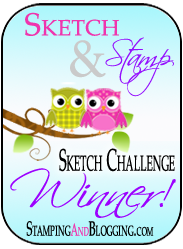 wow, you rocked this sketch challenge girlfriend, this card is over the top beautiful!..